Happy Friday everyone. I have a super simple design to show you tonight created with water decals. I really love water decals, they are so easy to apply and the effect you can get from some of the intricately designed ones can be quite spectacular. These are water decals I received from the Born Pretty Store. 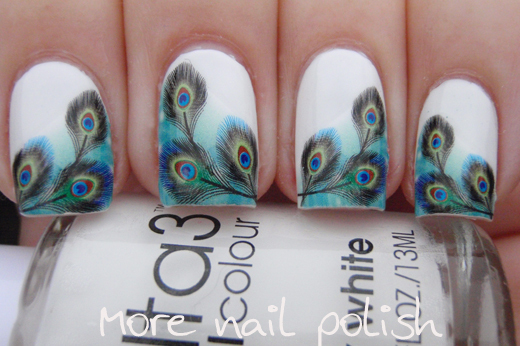 They are a french tip decal with coloured peacock feathers on a white base. You have to wear these over a white base, otherwise you will end up with a solid white background behind the decal that goes up diagonally from the lower feather edge to above the highest feather. 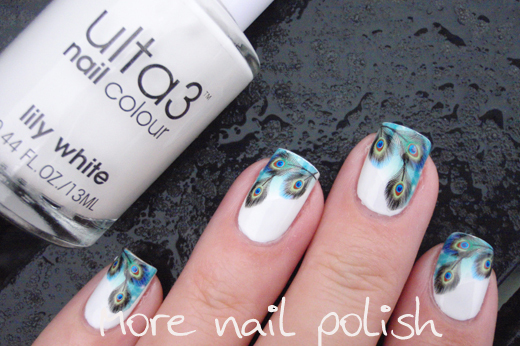 For this manicure I started by painting my nails white, I used Ulta3 Lily White. Then I just soaked off each decal in water and placed it onto a nail one at a time using tweezers. These decals were very sturdy. They soaked off the backing paper in less than 30 second and they felt quite soft, flexible and stretchy. I used my glass nail file to file downwards over the edge of the decal to cut it off at the length of my nail. These decals stick down quite well, but the tips did tend to wear and chip off after 24 hours of wear. So I would recommend using two coats of top coat and wrapping your tips. This is another excellent product from the Born Pretty and the end result is really fancy and very pretty. Here is the packet of decals you get. There are 10 in the packet and generally they were a good size for all my tips. I only needed to trim the sides on one or two of them to make them fit perfectly. 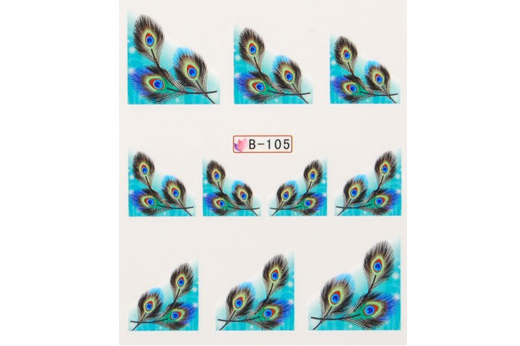 The are currently available on the Born Pretty Site, design B-105 for 99 cents with free shipping. Uau! that's just the most beautiful peacock sticker I've ever seen... I need it! right now!!!! I totally agree. I wish the background was clear so you could layer over a green and purple gradient! 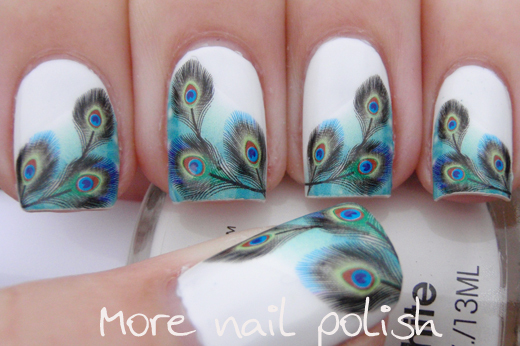 Linda essa nail,adorei este detalhe de pena de pavão,lindaaa.. These are so cool! 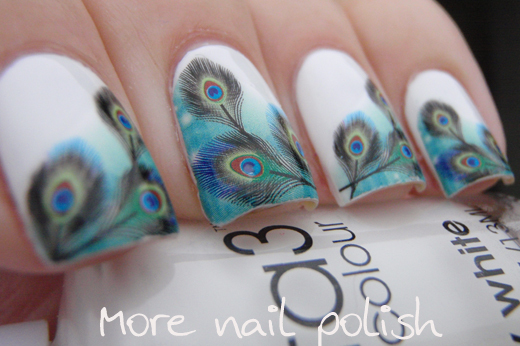 I love peacock feathers. Looks cool and calm. Like you should be at a tea party! 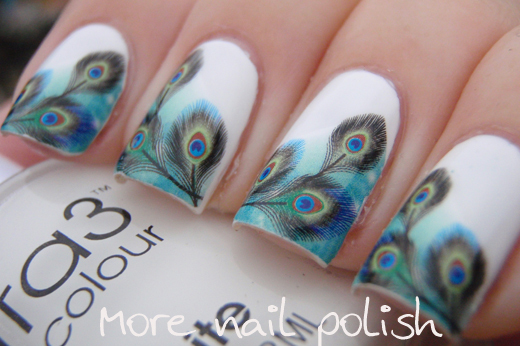 Wow those are really stunning! Dance Legend Holographic polishes - lots of them!